We are here to advise on how to attract applicants from City to your organisation more effectively, whether you are interested in advertising a casual or full-time vacancy, raising your profile on campus, and/or partaking in any of our careers events. City CareersHub is our online portal where employers can advertise their vacancies to all our current students and recent alumni (three years following graduation). You can register to use the portal for free at CareersHub. 32% of City's students come from non-EU countries. If you want to access the skills of these fantastic students but aren't sure how to recruit students who need visa sponsorship, read the AGCAS Guide to Recruiting International Graduates. Unitemps manages temporary and part-time vacancies including internships through our recruitment and payroll function at City. Our candidates are students and graduates of City where possible but can also be students/graduates from other universities and members of the public. Unitemps is an online 360-degree recruitment solution attracting applications and managing online timesheet processing, legislative compliance and budget tracking. We even offer an ‘advert only service’ which allows business to use Unitemps to advertise their roles through the Unitemps website. If you are an external business and you would like to find out how Unitemps can help you recruit then, please contact Lydia Hughes, Unitemps Branch Manager on +44 (0)20 7040 4684 or at lydia.hughes@city.ac.uk. We can send a targeted email to a selected group of students on your behalf. Advertise your graduate schemes, internship opportunities or open days to students from relevant courses. All emails come with a standard charge of £200 + VAT and will be forwarded on to the student groups of your choice within three working days. Who can I send an email shot to? You can select up to eight courses when sending an email shot and the email will be sent to all students on those courses. You are also able to specify specific year(s) of study (e.g. final year students on a certain course). This level of detail ensures your email shot is as targeted as possible. View a list of courses currently on offer at City. If you would like to send an email shot to City students, please contact the Employer Engagement team, at careershub-vacancies@city.ac.uk. 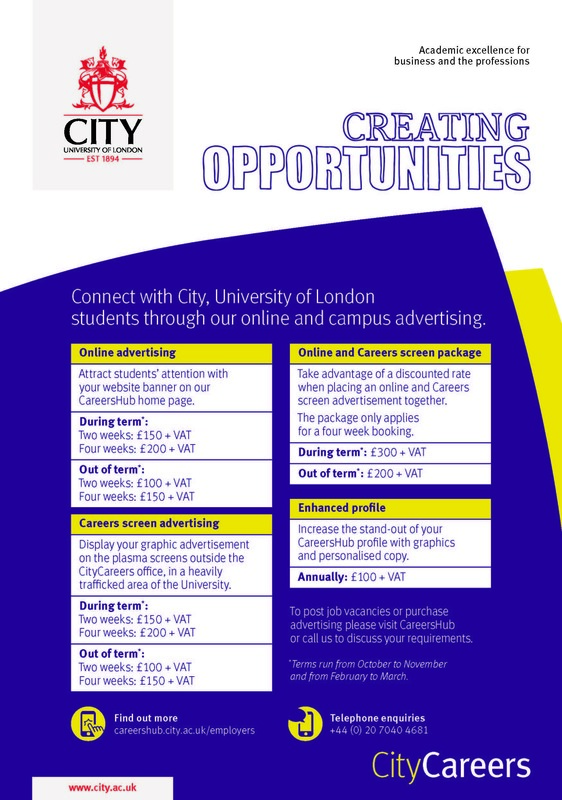 City is a member of The Careers Group, which includes careers services at most other University of London Colleges. The Careers Group administers JobOnline, a central vacancy distribution board. *If you are a third party advertising on behalf of a client then you will be charged £159 + VAT per month per advert. This charge is for JobOnline only and does not apply to City's CareersHub. We have recently rolled out an intern scheme in FT.com and we have both been impressed with the calibre of applicants from City - we currently have one City student interning with us. Many thanks for publicising the opportunities. I have started to receive some applications and I really pleased at the response so far. I am pleased to let you know that we received 6 applications from City students, 4 are 2010 graduates and the successful applicant was from City. In total we received over 20 applications for the role from various universities in the London and surrounding counties. We received four applications (from City) and we recruited three of these. I think you do a great job and we were very impressed with the knowledge and skills of the students we offered internships to. We have had an excellent response from your website and have decided to offer the position to a City grad...Thank you once again for your help with this. Thank you very much for your help and your cooperation, I was really impressed by the rapidity and the efficiency of your services!